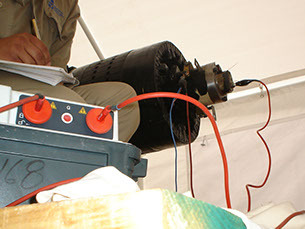 GTS has an extensive array of testing and maintenance knowledge pertaining to any brand turbo or hydro generator. We are a comprehensive generator repair organization that can provide you with a single source provider for all of your generator inspection, testing and maintenance needs. In addition, GTS offers a large selection of high quality replacement and reverse engineered generator parts. In addition to the below services, GTS can offer you a custom tailored long term maintenance contract that will remove the planning and guesswork from upcoming outages. If you have any questions or would like to speak to a specialist to help plan your upcoming outage please contact us. Please browse through the sections below to discover what GTS can offer your organization. GTS offers a comprehensive battery of industry standard tests for your generator stator, rotor, exciter and bushing. Our testing services will provide you, the customer, with an accurate analysis on the overall condition of your generator. Please click on the above link to navigate to the testing page to see a comprehensive list and descriptions of all the tests we offer. 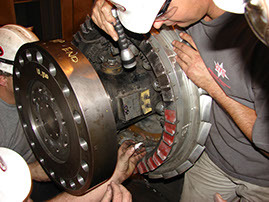 GTS can offer you annual or biennial minor inspections along with major inspections to maintain or even extend the working life of your turbo or hydro generator. 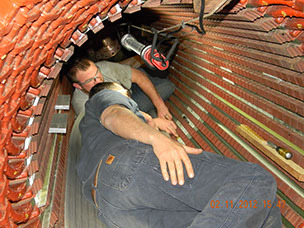 Annual or biennial inspections can prevent or rectify any issues that may occur. From epoxy application to compete stator or rotor rewinds, GTS will work with you to provide the necessary repairs to ensure that your generator continues to operate at peak efficiency. Please click on the above link to see a complete list and descriptions of the repair services that GTS offers. GTS can provide value before your outage begins with our consulting services. GTS can assist with outage planning, scope of work, schedule, recommendations, parts, and on site outage customer representation. For additional information please call (850) 471-1101 or email us. GTS has the capability to provide replacement or upgraded parts for many of the components in your generator. These parts are the highest quality available and are produced using the most advanced technology attainable. The link above will take you our Parts page which includes descriptions of the parts that we can offer your company.